Diagram shawin the face o the "three-pynter" sensitive aircraft altimeter displayin an altitude o 10,180 feet. 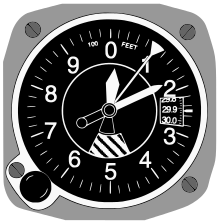 An altimeter or an altitude meter is an instrument uised tae measur the altitude o an object abuin a fixed level. The measurement o altitude is cried altimetry, which is relatit tae the term bathymetry, the measurment o depth unnerwatter.